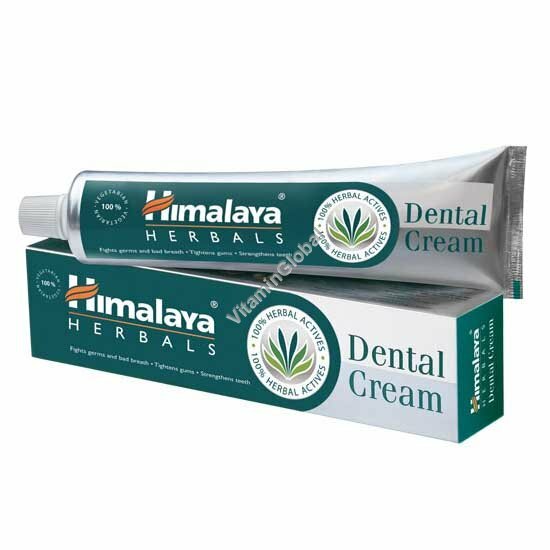 Himalaya Herbals Dental Cream is a specially formulated toothpaste that tightens and reduces swelling of gums, stops gum bleeding, prevents toothache, decay and controls bad breath. Ingredients: Carum copticum (Bishop's Weed, Ajamoda satva), Vaikranta bhasma (Fluorspar), Azadirachta indica (Neem, Nimba), Xanthoxylum alatum (Toothache Tree, Tumburu), Punica granatum (Pomegranate, Dadima), Acacia arabica (Indian Gum-Arabic Tree, Babbula), Vitex negundo (Five-Leaved Chaste Tree, Nirgundi), Embelia ribes (False Black Pepper, Vidanga), Triphala comprises of Emblica officinalis, Terminalia chebula and Terminalia bellirica. Use Directions: Brush the teeth with Dental Cream, twice daily.